Colorado Pioneers was also the last film appearance of Billy “Buckwheat” Thomas. During the years he played “Buckwheat” in the Our Gang comedies, Billy Thomas had become an American icon. World War Two put a crimp in the popularity of the perennial series, and Hal Roach reluctantly brought the kid’s antics to an end. Billy was at that awkward age where he was too old to play a cute kid, and too young to play juvenile leads. Being the most visible Black American in films didn’t help him at that time because mainstream Hollywood still had not figured how to write stories about Blacks. 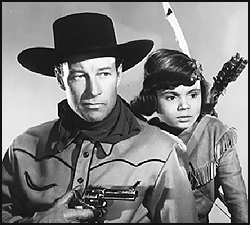 His grandmother managed to get him a small role in Colorado Pioneers, one of the first films made from the popular Red Ryder stories that sprang from a comic-strip cowboy created by writer Stephen Slesinger and artist Fred Harman. Red Ryder premiered in the Sunday funnies on November 6, 1938, and soon grew into one of the largest franchises in entertainment history. In the 1940s, there was nary a kid-friendly product that didn’t have a Red Ryder tie-in: comic books, novels, Big Little Books, a radio show, and the infamous Red Ryder BB Gun, which is still in production today despite the fact that Red Ryder hasn’t appeared in newspapers since the 1960s. For thousands of baby boomers, the Red Ryder BB Gun wasn’t the only way to put an eye out, but it was the most universal. Billy’s role in Colorado Pioneers was seen in theaters after an initial release on November 14, 1945. Sadly, this appearnce would be his last. Billy never appeared in another movie. He went on to be a father, a soldier in the Korean War, and lived a normal life working steadily on the fringes of film production in a couple of labs. Everyone knew “Buckwheat,” but few people knew Billy, the man behind the myth. This month, get several copies for Christmas gifts of “Otay!” The Billy “Buckwheat” Thomas Story, written by his son, William Thomas, Jr., for the fascinating story of what happened to Billy “Buckwheat” Thomas. Visit http://www.bearmanormedia.com for more information.